Nice heavy Brockway Pepsi collector glass from the twelve days of Christmas series in 1976. This is the 4th day of Christmas, four colly birds glass. 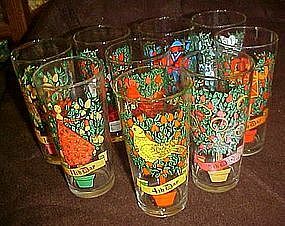 These were the ones you had to buy a product in. Measures 6 1/4" tall and graphics are nice crisp and bright. I have others listed to this series, and all are PERFECT.